whole-leaf black tea grown 5000 feet above sea level, in the valleys of the Andes Mountains, where the air, cool from the snow-capped peaks of the Andes, mingles with air moist and warm from the Amazon. 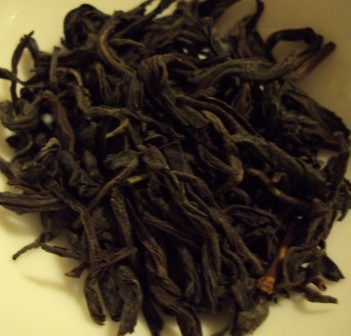 A blended cultivar, not a specific cultivar as from China or Assam. A completely unique cup. If you need a comparison to tea from another origin, you might find Bolivian black tea akin to Assam black tea, but without the bite that many people find harsh and don’t like in Assams. Bold, strong, malty, earthy sweet, woody, burgundy, raisiny, roasted sweet potato, nurturing are all terms that come to mind as you savor this hand-harvested, orthodox-processed, organically-grown black tea. The dry leaf smells quite remarkable – although it is difficult to find the words to adequately describe it. I can smell notes of fruit and flower as well as a deep, caramel-y undertone and a subtle earthy note as well. But here’s the thing – it smells so much better than that description sounds. The brewed liquor’s fragrance softens somewhat, but I can still smell a sort of caramelized fruit note as well as a lingering floral presence. It’s really quite lovely. But the smell is NOTHING compared to the flavor. This is a delightful cup of tea. This is a very full-bodied, robust cup of tea – and I agree with all of the terms that are listed in the company description of this tea (provided above). I can taste that deep, raisiny flavor, I can taste notes of wood and earth, and I can taste similarities to burgundy and sweet potato with a nice, roasted, caramelized crust. There is a delicate malty note to this as well, not as strong as an Assam might be; it’s more of a smooth malty note. What is so irresistibly delicious about this tea is the rich, caramel-y, burnt sugar flavor that arrives at the finish. It tastes so good that when it hits the palate, you want another sip! I LOVE this tea – in fact, this is the best candidate so far to replace my beloved Dawn (from The Simple Leaf which is now closed). While these two teas are certainly not identical, the way my palate responds to this is similar to the way my palate responds to Dawn – and that brings a big smile to my face! And even more importantly, if I cannot have the one, I am more than content with having the other!